Home » Twiniversity Tips: Splish Splash – Giving your twinnies a bath! Twiniversity Tips: Splish Splash – Giving your twinnies a bath! Bath Time is one of the most joyous occasions in many households. Why? Well what’s better then having a freshly washed kiddie snuggle you right before bed…yup….having TWO freshly washed kiddies. Pop Quiz: What is the ideal temperature for your kiddies bath water? Answer: 102 degrees (38.8 C) is ideal. Not too hot, not too cold, it’s juuuuuust right! Can’t figure out if your water temp is good enough. Pick up a cute water thermometer to help you out. If you are bathing your twinnies solo, please make sure you bath them one at a time until they can sit up well on their own. 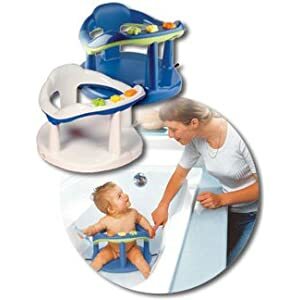 Slippery babies are dangerous babies and safety should be your main concern during bath time (and all times for that matter). Also make sure you have EVERYTHING you need on hand. Soap, towels, washcloths, toys, etc. Once the process begins, there is no running to answer the phone or answer the door. Your attention needs to be on your kiddo 100%. Make sure the room is warm enough. Imagine taking a warm shower and then walking into a freezing room. Yeah, not so pleasant. A room temperature of around 75 degrees is ideal. Make sure the tub has water in it before placing your twinnies. If the water is running, and changed temperature quickly, you are in danger of injuring your kiddos badly. It takes only two seconds for your child to get a third-degree burn from water that is 150 degrees, and only five seconds if it is 140 degrees. Full daily baths for your newborns are not necessary. If you are quick to change a dirty diaper your babies aren’t getting that yucky. A few times a week is more than enough, and more than that has actually proven to dry out your twinnies skin. There is no perfect time to bathe your twinnies. Some parents prefer mornings when their kids are full of energy, other prefer to using it as part of their bed time routine. It depends on when you have the most time to spare. Tub or Sink? Depends on your preference. Personally I feel bathing your twinnies in the sink is best till they don’t fit in it anymore. Using the sink is easier on your back and forces you to wash your dishes/load your dishwasher giving you one less chore to take care of after they go to bed. If you use the sink, an insert like the Safety 1st Sink Snuggler or the Bloomin bath is a great idea for both comfort and safety. Curious to know how much water you should put in the sink/tub? For infants start out with 2-3 inches. That’s all you need. They are tiny don’t forget and they don’t need to be submersed after all. You just need enough water to clean their dirty bits. Wash the dirtiest parts last! Start off with their face and work your way down. Don’t miss any chubby folds, milk loves to hide out in these crevices. If you ever looked under your babies neck, you’ll know what I mean. When the twinnies get bigger and you have to move to the tub, you have a few options. #1. You can use a bath ring. #2. A baby tub. or #3. A bath tub insert or even #4 A laundry basket (see picture above). If space is an issue, you have to check out this tub which folds up flat! While you’re shopping, consider getting a kneeler or small bath bench, since you’ll spend a lot of time hanging over the side of the tub washing your twinnies. Getting soap that has a pump is ideal so you can dispense some wash and not take a hand off your baby. An all in one baby wash like Johnson’s Head to Toe Baby Wash is ideal. The soap is gentle, smells great and you can pump it with one hand. After the bath consider using a baby lotion. This will add some moisture back into their skin and give you a chance for a little one on one bonding time which is always great. Folks also find that bath time is a great bonding time. If you like, take your baby in the tub with you, BUT make sure there is another adult on hand to pass a baby to. “Overall, about two-thirds of accidental injuries happen in the bathtub or shower” according to an article in the LA Times. So be safe, enjoy your twinnies, and use bath time as a way to connect with them one at a time.